The Spaghetti alla Puttanesca has a saucy history, almost as rich as the recipe in front of you. The dish’s scandalous name gives life to many legends. Many are in fact the theories about the origin of pasta alla puttanesca: according to some, the dish was invented in the early twentieth century in some brothels in Naples as a “refreshment” for guests returning from “the labours of love”, while for others this would be the dish that just women who worked in the brothels ate at dawn to recover from the stressful night. One of the most popular stories around this delicious spaghetti reports that unfaithful wives cook this dish for their husbands in a great hurry to be soon reunited with their lovers. A very colourful origins for one of the highlights of Campania’s local tradition! The historical background of spaghetti alla puttanesca shows different interpretations. In “Napoli at table”, Arthur Schwartz states that etymologically: “(the term puttanesca) was the subject of the efforts of the imagination of many scholars, who have tried in every way to find the solution to the riddle. Some say that the name of this recipe derived, at the beginning of the century, by the owner of a brothel in the Spanish Quarter, which was usually refreshment guests with this dish, taking advantage of the speed and ease of preparation. Others refer to the undergarments of the girls of the house, to attract and entice the eye of the customer, probably wore linen of all kinds of bright colors and full of promising transparency. The many colours of this dress would find themselves in the homonymous sauce: the green of the parsley, red tomatoes, purple dark olive, gray-green capers, peppers garnet hue. Others argue that the origin of the name is to be attributed to the imagination of a young girl’s life Yvette the French, who was inspired to his roots in Provence. Yvette, probably, was not equipped with only fantasy, but also a sense of humour and irony rather caustic, perhaps exploited to celebrate, through the name of this dish, the oldest profession in the world. [… ]”(pg. 164). A different interpretation is given by Jeanne Carola Francesconi in “La Cucina Napoletana”: […] These macaroni, although the richest of their relatives, they called marinara. But immediately after the Second World War, in Ischia, the painter Eduardo Colucci, do not know how it cause, they renamed with the name that is now generally known. Colucci, who lived for friends, in summer lived in Punta Mulino – at that time one of the most picturesque corners of Ischia – in a tiny rustic and construction; room with kitchenette and a terrace in the middle of which rose a olive tree. Besides the usual closest friends, paraded on the terrace the most varied Italian and foreign personalities. And he, having offered as an aperitif a fresh and genuine vinello Ischia, often improvised a dinner of macaroni that these were his specialty. […]”. Another version was instead provided by the architect Sandro Petti, who claimed in an interview that he had invented him the sauce “puttanesca” in his restaurant in Ischia. According to the architect, in fact, this famous recipe was given birth by his culinary genius, when one night arrived hungry at the restaurant a group of his friends. Despite the cook had already left and was not in the kitchen pantry almost nothing left, they insisted to eat something, asking breasts prepare “una puttanata qualsiasi” (indicating that they were content to something simple). So it was that the architect began in the kitchen, took a few simple ingredients and the sauce was invented by the intense flavour and served them to friends over a plate of “pasta al dente”. These appreciated so much the food, that convinced Petti to insert the dish on its menu with the name of “puttanesca” in memory of the request made that evening. The puttanesca sauce recipe is a very common both in Campania and in Lazio, of which there are several versions: with some chili, other without anchovies, capers and parsley or others with black pepper. Whether its past, the dish holds true as a classic Italian dish. Put a pan on the stove rather large and be warm with butter and oil, then add the garlic and finely chopped anchovies and previously pounded in a mortar or chopped finely. 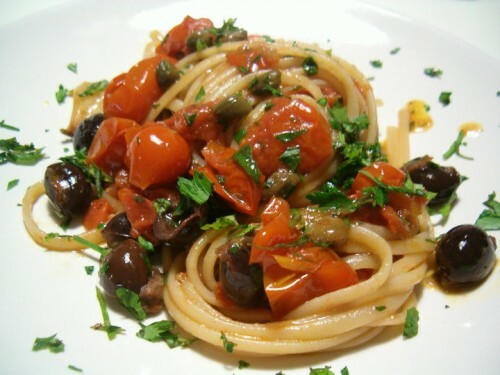 When the garlic begins to brown and anchovies melt, add the olives pitted and cut in half, roughly chopped capers and tomatoes peeled and filleted. Fate then season the sauce over high heat for a few seconds, stirring constantly. Meanwhile, cook the spaghetti in salted water, drain and place in a bowl in which they serve, then cover them with the previously prepared sauce and sprinkle with parsley. Mix and serve warm your delicious spaghetti puttanesca! This entry was posted on Thursday, January 22nd, 2015 at 10:48 pm	and is filed under Italian Recipes and Food. You can follow any responses to this entry through the RSS 2.0 feed. You can leave a response, or trackback from your own site.